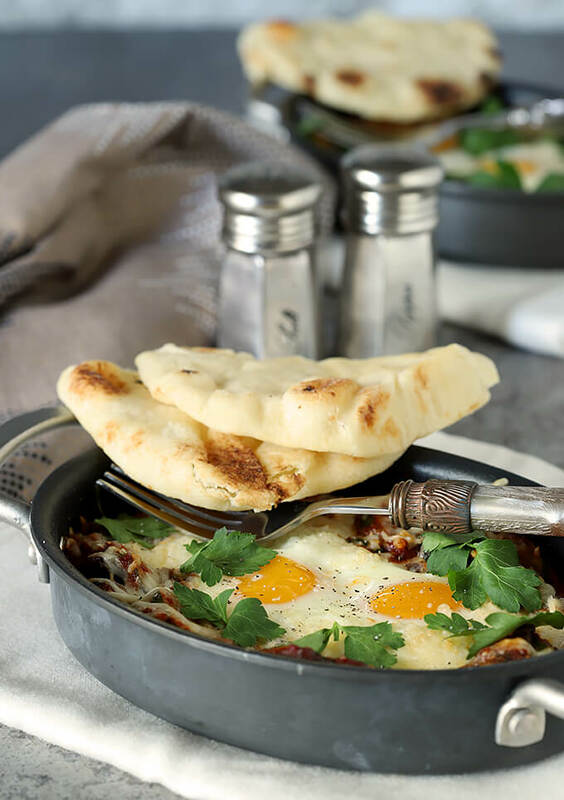 A delicious mix of veggies, tomato sauce and spices topped with a poached egg, Shakshuka with Zucchini and Mushrooms is my take on a classic Middle East dish that is satisfying for breakfast, lunch, or dinner. Shakwhata you say? What the heck is that? Well, it’s a delicious one pan meal that typically consists of eggs that are poached in a tomato sauce spiced with cumin, paprika, and cayenne. Still, it has been embraced by so many cooks there are now a million versions…thought I might as well add mine. I have seen the dish posted occasionally when I’m online but I never really delved into the ingredient list so I was flying blind the other night when deciding on dinner. Honestly if I didn’t just happen to magically have items positioned close to each other in the fridge that give me inspiration on many nights, I would be lacking some great dishes on this blog. This time was no exception. Mushrooms and zucchini were in the vegetable drawer with a bottle of half empty tomato sauce right above them next to a large carton of eggs. How much of a hint did I need anyhow? Not much; this came to me immediately. Shakshuka originated in North Africa, and like many great dishes there are as many versions as there are cooks who have embraced it. This one strays from more classic renditions with the addition of Parmesan cheese; so not traditional but so good that I’m glad I thought, why not? What I love is the versatility. 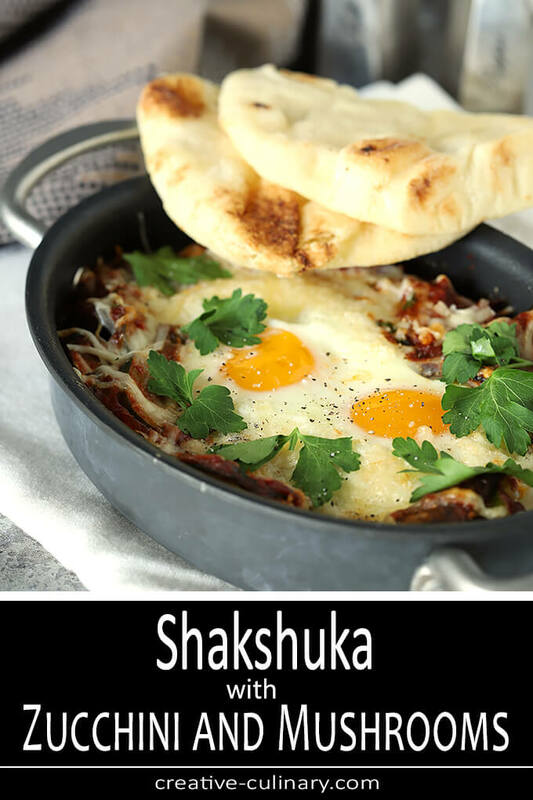 Great for breakfast, lunch, or dinner; shakshuka is easily modified depending on ingredients you want to include; I’ve seen spinach and potato hash versions and both sounded fantastic so it is a place where you can get creative too. I also had in mind my daughter Lauren; she had just informed me that she was going the Whole 30 meal route this month. 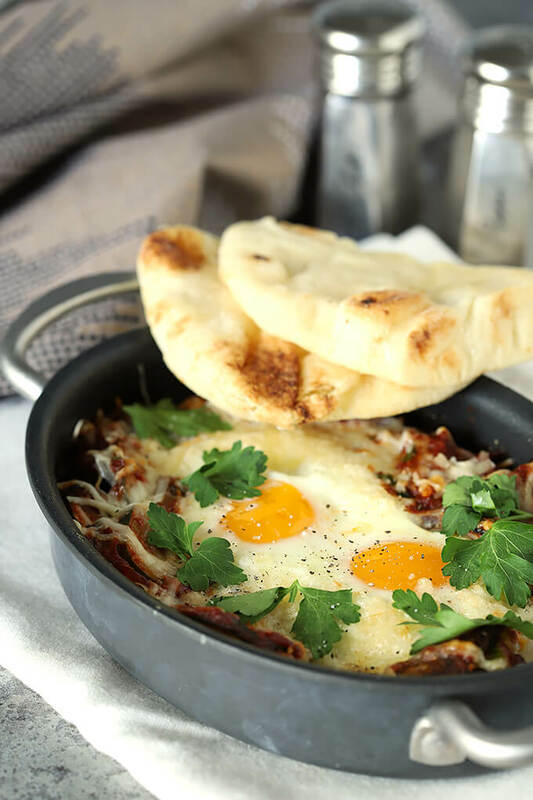 Lots of restrictions with that plan but except for the cheese and bread shown in my version, this Shakshuka with Zucchini and Mushrooms is a dish that would be perfect. Hearty and full of flavor but easy to make both Whole 30 and gluten free. I have friends and family on those paths now so I like to accommodate them when I can. It’s a one-skillet recipe of eggs poached in a tomato sauce spiced onion, garlic, cumin, and oregano (trust me; SO good!) filled with zucchini slices and mushrooms. First you make that sauce, which comes together fairly quickly on top of the stove, then you gently crack each of the eggs into the pan, nestling them into the sauce and then the pan is moved into the oven to finish. I modified the spices a bit; eliminating the cayenne but adding some onion and garlic too…that’s how I roll! Shakshuka and Eggs in Purgatory...both names associated with eggs baked in tomato sauce. This version has a hint of Italy with some grated Parmesan and fresh parsley. Easy, beautiful and delicious from breakfast to dinner. Healthy too! Position a rack in the center of your oven and preheat the oven to 375 degrees F.
Heat the olive oil in a large, ovenproof, skillet over medium-high heat. Add the onion and cook, stirring often, until the onion is translucent, about 3 minutes. Add the zucchini and mushrooms and cook just until they release some of their water and it evaporates; another 3-4 minutes. Add the garlic and cook until fragrant, about 30 seconds. Stir in the tomato sauce, oregano, cumin, and salt. Bring to a simmer and let cook until slightly thickened, about 3 minutes. With the back of a spoon, make 4 indentations in the sauce. Crack one egg inside of each, then sprinkle the dish with Parmesan cheese. Carefully transfer the pan to the oven. Bake until the egg whites are set but the yolks are still soft, 8 to 12 minutes (egg sizes will make a big difference so watch carefully). Remove from the oven and sprinkle with fresh parsley. Serve hot with warm naan or pita bread. I made my dish using individual skillets; cooking times are about the same, just keep an eye on those eggs! Love this dish! It’s a dinner dish for us (we’re not huge breakfast eaters), but it’s good any time of the day. I think there are as many different versions of this dish as there are cooks! Yours looks particularly delightful — thanks!